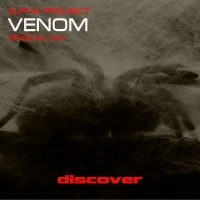 Next up on Discover is Alpha Project which is a collaboration between Alex Upton and Andy Cain - a producer who is quite literally smashing it in 2016 after making a huge splash in 2015 with several chart topping releases. Originality is the order of the day with Venom and it is all about the top line which is as discordant as it is beautiful. Infectious till the end, you can't hide from this one as it permeates your ears from the off!! Great work from Alpha Project. 'Venom' is available now from Beatport and iTunes.